Seven continents and twenty countries are looking for solutions to ethical and responsible fashion, and “Global Sustainability Fashion Week 2019” will be offering an established platform to bring these ideas to the forefront. This is the 4th consecutive year that Global Sustainable Fashion Week (GSFW) is being held which has now become an internationally recognized event. The four day event which encompasses fashion shows, panel discussions, conferences as well as other events, will be held in Budapest, Hungary from April 8- 11, 2019. The main focus of GSFW will be exploring the notion of sustainability in fashion across borders and through creative and innovative design. It will also draw attention to social responsibility towards a more ethical and ecologically friendly fashion scene. Now-a-days there is no need for introductions to the GSFW event series within the sustainable fashion industry. Dr Gabriella Mányi Walek president of the National Fashion League Hungary Association, initiated this event series four years ago, attracting participants from 15 countries. Today GSFW has grown to become one of fashion’s most important events. From the words of Dr Gabriella Mányi Walek “GSFW can be seen as a unique and necessary initiative, as it promotes international cooperation and solidarity. It can be seen as a truly vibrant and diverse cavalcade of events, with designers and presenters from all over the world. Globalization is apparent through the international team represented at GSFW, a melting pot of cultures, where differences are put aside for the good of a common goal. That common goal is a more sustainable and ethical future in the fashion industry”. The main mission of the National Fashion League Hungary Association (NDL) is to promote and support creative and innovative design, as well as nurture folk traditions which primarily represent sustainable methods of production. On top of this, NDL is dedicated to calling for social change in the fashion industry. Importantly, they offer assistance to manufacturers, designers and fashion industry workers who work with such ethical concepts. This is a massive endeavor, which is why there is a need for partners and sponsors - who share these ideas and values - to come together and create change on a larger scale. The 4th GFSW will be held across two locations in Budapest, the first two days (8 – 9 Apr) will be held at the Italian Institute. The final day (10 Apr) will be hosted at the BKIK head office and a special VIP event on that evening will be held at the Tildy Palace. This is in cooperation with the Argentinian Consular Office where works of Argentinian designers will be showcased. The three days will encompasses press conferences, workshops, panel discussions, fashion shows and exhibitions. Participants can gain inspiration and insight to the global sustainable fashion world, measure their own steps of social responsibility from industry’s perspective, as well as network with like-minded people. 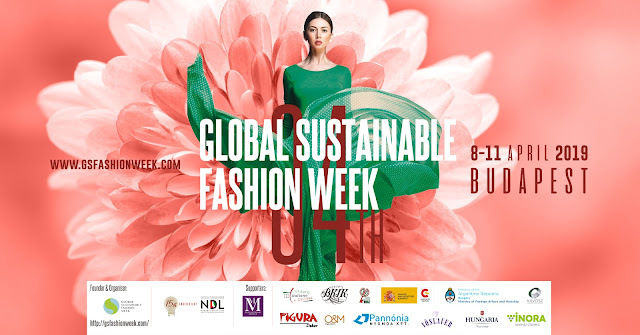 Among the invited are players from 20 countries, representing each continent, using GSFW as their platform to showcase their eco collections, voice their opinions and share their experiences in the sustainable fashion industry and ethical manufacturing. Topics to be covered include the trend of “excessive consumerism” and “fast fashion” and how they impact the environment. This year’s special guest is Emmy award winning designer, Jeff Garner, who has worked with and designed for celebrities such as Gisele Bündchen, Taylor Swift, Cameron Diaz, Rihanna, Miley Cyrus and Sheryl Crow. Wolfish skin which is a byproduct of the fish processing units. Hungary and ramie textile from China. In cooperation with the Madrid Sustainable Fashion Association, five Spanish eco fashion designers will also host a separate fashion show. Next to these international well accomplished designers, a range of young and emerging designers will also exhibit their eco designs from Hungary and abroad, including…..
……and many more designers of clothes, accessories and shoes, as well as five selected applicants of the WORTH EU project, including the winner Gabriella Veszprémi. Finally, Anna Fehér (Hungarian) with her Frida inspired jewelry range and Botond David’s (Transylvania) impressive 1,300 “folk inspired” photography exhibition will be displayed as holograms. Katherine Soucie - Award winning Vancouver, Canada based artist, designer, entrepreneur, educator – specialising in the transformation of textile industrial waste.